Bellavitano Cuts Cheese, 1 Pound -- 10 per case. 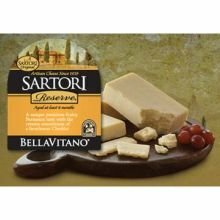 A Sartori original artisan cheese crafted in the heart of Wisconsins dairyland with a unique flavor profile.... Created by the master cheesemakers at Sartori using time-honored techniques and the highest quality milk, Bellavitano features a rich and creamy texture with a great, cravable taste reminiscent of an aged, premium Cheddar balanced by a full flavored Parmesan Bellavitano offers a versatile flavor with excellent melting characteristics and a smooth, creamy mouthfeel. Use it to turn family favorites like Mac & Cheese, French Onion Soup, Cobb Salad and more into something special with the powerful appeal of Bellavitano cheese. Our most requested cheese, BellaVitano combines the rich and creamy flavor of a young Cheddar cheese with the savory, crystalline crunch of a premium aged Parmesan. If you have any questions about this product by Sartori, contact us by completing and submitting the form below. If you are looking for a specif part number, please include it with your message.